I have taken some pictures of converting my headlights from Halogen to HID. The thumb nails are all compressed 50 %. The big pictures are not compressed at all. 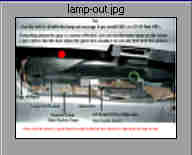 Here is the location of the wire to cut to disable the CHECK EXT LAMPS message. I read on the LOD message board that someone replaced their bad HID bulbs with halogen bulbs in the HID housings. They commented that there was not much difference in light output. 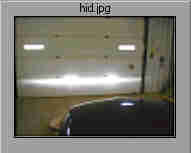 The next 2 links are to pictures of the door in our shop with the headlights turned on. This is a picture of the halogen bulbs in 96 HID headlight housings. I mounted them in the HID housings thinking that I would not spend the extra money for the HID bulbs and ballast if they were almost as good. 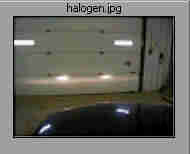 Below is a picture of HID bulbs taken about 1 hour later with the same HID housings. You decide!!! I spent the extra money!!! All of the next sets of pictures were taken with these settings, on a tripod directly in front of the car 4 feet off the ground. No adjustment was make for the orange color that always seems to be produced by incandescent bulbs (halogen), when you take a picture. 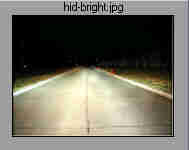 You will notice that the light from the HID bulbs appear much whiter, something that I did not notice as much looking down the road, but the camera did. All of the pictures are 800X600 and between 200k and 300k. There are four orange cones set at 88 feet intervals (1 second at 60 mph). The 2 lights on both sides of the road after the forth cone is a fifth cone at 88 more feet with reflector tape on it just to see which light reflected best. These are pictures of the light from the old halogen headlights. Sucked BIG time!!!! The reflectors and lens were bad in both of these units the left one much worse. I tried PIAA's and 100 watt bulbs (PIAA's are a waste of money - my thoughts), the 100 watt were much better, and I could not hurt the reflectors as they were already bad. These are pictures of the light from a friend's 95 Mark VIII with 65 watt high intensity blue bulbs. The bulbs were from Germany. The lens and reflectors were like new. 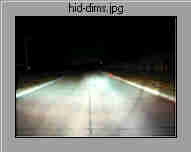 These are pictures of the light from a new set of HID headlights installed into my 93 Mark VIII. 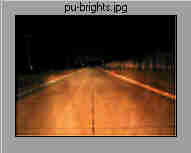 The Bright picture is with both low and high beams on, as that is the way the 96 LSC's are. 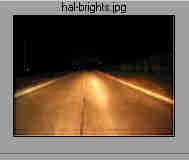 These are pictures of the light output from my 98 GMC Sonoma halogen headlights, factory aligned when new. I think the GMC has the best light output for seeing the most distance. I have now cut off the lens from the old headlight assembly and have installed clear Lexan for the lens. With the clear lens on them the light is so bright that it looks like a train coming at you. Also has round spots like a spotlight, totally unusable without some kind of diffusion. 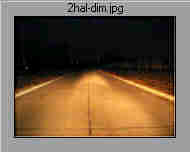 I plan to build a wooden jig the same height and distance apart as the car to mount both headlights (left and right). Then do some playing around with the lens. I will put any new info here when I get to work on this. Article by Bill Hittle. For questions and comments contact him at e-mail.